The Jeff Hanneman Memorial Celebration will occur Thursday, May 23 at the Hollywood Palladium in Los Angeles from 3:30 – 7:30 PM. It will be open to the public on a first-come basis subject to venue capacity. All ages are welcome, and paid parking will be available around the venue. The Jeff Hanneman memorial celebrates the life and work of Slayer’s guitarist, who passed away on May 2. You may want to see tributes by other musicians, the band’s memories of Hanneman, our explanation of his importance, and a visual tribute to Jeff Hanneman by the National Day of Slayer. To summarize the above, Hanneman was not only central to the Slayer sound but to the spirit of metal. At a time when most bands were trying to be more like pop music in order to be popular, Hanneman pushed Slayer to be more realistic and yet more mythological, joining artists such as J.R.R. Tolkien and John Milton in showing us occult doom all around us based on the degeneracy of modern people. His intense riffs, angular chord progressions, blazing solos and most of all spirit and attitude drove Slayer, and through them metal, to be more than just another flavor of rock. They became otherworldly. Jeff Hanneman helped shape Slayer’s uncompromising thrash-metal sound as well as an entire genre of music. 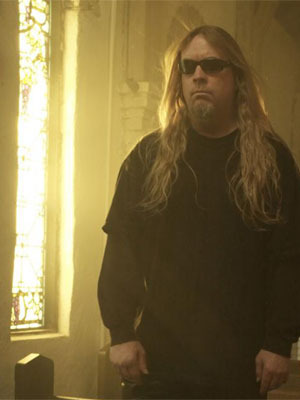 His riffs of fury and punk-rock attitude were heard in the songs he wrote, including Slayer classics “Angel of Death,” “Raining Blood,” “South of Heaven” and “War Ensemble.” Hanneman co-founded Slayer with fellow-guitarist Kerry King, bassist Tom Araya and drummer Dave Lombardo in Huntington Park, CA in 1981. For more than 30 years, Hanneman was the band member who stayed out of the spotlight, rarely did interviews, amassed an impressive collection of World War II memorabilia, was with his wife Kathy for nearly three decades, shut off his phone and went incommunicado when he was home from tour, did not want to be on the road too late into any December as Christmas was his favorite holiday, and, from the time he was about 12 years old, woke up every, single day with one thing on his mind: playing the guitar.